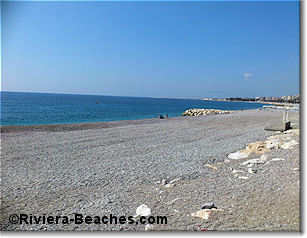 In front of Lenval Hospital, Lenval public beach is bordered on the west by Bambou Plage beach restaurant. Lenval is a no-smoking beach. The rule is in effect 9am to 6pm May to October. (Centenaire is the other non-smoking beach). The beach is slightly narrower than other public beaches which makes it harder to escape traffic noise from the Promenade. A narrow ramp next to the stairway access makes the beach more accessible for wheels such as carriages, strollers or luggage. There's no lifeguard at this beach but you're within walking distance of nearby Magnan beach with lifeguards and a first-aid station.See more about lifeguards. There's limited hourly parking on the Promenade des Anglais and expensive hourly parking at Lenval Hospital. At the western end of Lenval beach, there are indoor hot water showers (€1.60), left luggage and a WC (€0.60). Convenient! The Fabron/Lenval bus stop is on the Promenade at Bambou Plage . You'll find buses 8, 11, 52, 59, 60, 70, 94, 98, 200, 230, 400, 500. See more on buses in Nice. Choices for snacking are limited. It's best to bring your own sandwich or dine at nearby Bambou Plage. 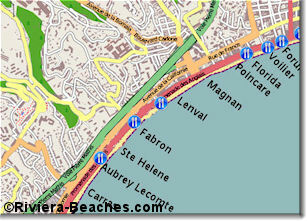 The nearest hotel is Etap on ave de la Californie at the western end of Lenval beach.